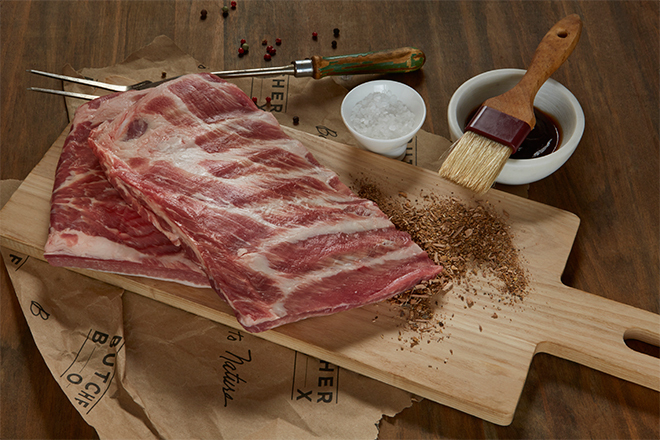 Thicker and flatter than baby back ribs, St Louis Ribs attribute their rich flavor to delicious belly fat. These ribs, cut from the lower half of the rib section, were first trimmed into a rectangular rack in St. Louis – hence the name! Make sure to steam or add liquid to your ribs during the cooking process to keep them moist. 1. Preheat grill. If using open flame, wait for flames to die down. Add well-soaked wood chips to grill. Right before grilling, make sure grill surface is extremely hot, then rub it down with an oil-soaked rag – we advise using tongs to hold the rolled-up rag. 2. Place St Louis Ribs at 45° across hottest part of grill grates, and grill both sides for 30 min per side side, while rotating 90° every 15 min. Keep your meat moving to ensure that it cooks evenly. Close grill cover between turns to allow smoke flavor to penetrate. 3. Remove ribs from grill, and wrap in foil. Add a small amount of liquid to the inside of the foil, and wrap tightly. 4. Place wrapped ribs on sheet pan, and transfer to 325°F preheated oven. Cook for 1 – 2 hrs, or until fork-tender. 5. Rest for at least 30 min. 2. Add oil. Once oil is hot, sear St Louis Ribs on both sides for 2-3 min per side, or until brown crust forms. Remove and set aside. 4. Place ribs back into Dutch oven. Add any remaining ingredients. Cover ribs halfway with braising liquid. 6. Finish the ribs on the stove top at the same low simmer, or in a 325°F preheated oven. Cook for 2 hrs, then remove cover and cook for 1 hr, or until fork-tender. 7. Rest in juices for at least 30 min.